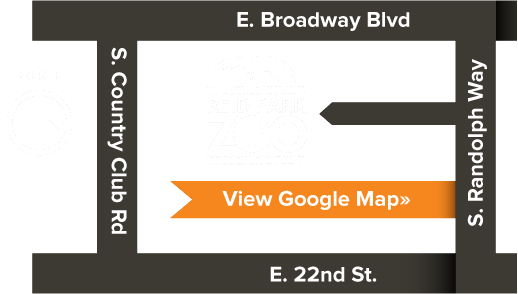 Open Daily 9 a.m. to 4 p.m.
Reid Park Zoo is committed to providing experiences that inspire adults and children to care for wild animals and wild places. Always check the daily schedule in the front plaza for Keeper Chats, training demonstrations, and activities for kids. Reid Park Zoo and Taste of the Wild Catering offer a unique experience for your child’s special day. Become a “Parent” to Your Favorite Zoo Animal. Share your passion for wildlife and conservation with others. Turn your passion into a career. Can't make it to the Zoo? No worries. With our Zoo to You Outreach programs, we will come to you! pre-school groups, scout groups, friends and family groups; we have a variety of programs for everyone! Looking to take your K-12 students on a field trip to the Zoo? We offer a variety of free resources and discounts for teachers! A Family membership pays for itself in less than 2 visits with free, UNLIMITED day-time Zoo admission year round. Join Today! Reid Park Zoo offers a discounted membership rate to 501 (c) (3) non-profit agencies that are a resource for the Tucson community. Support from businesses and organizations help further Reid Park Zoo's commitment to saving wild animals and wild places. At Reid Park Zoo we are actively involved with conservation programs around the world. Twinkling lights, hot chocolate, and family. It’s the most wonderful time of the year at Zoo Lights, presented by Tucson Electric Power. Sip hot chocolate as you stroll under the twinkling lights of Tucson’s favorite holiday tradition. Thousands of twinkling lights and lighted animals displays illuminated the beautiful Zoo grounds with sounds of the season being heard throughout the Zoo. Zoo Lights begins with a Members-only night on December 5 and then opens to the public from December 6th through the 23rd with Encore Nights December 26th through the 30th. Santa will not be at the Encore Nights as he will have returned to the North Pole. Zoo Lights is a family-friendly event. Carousel rides will be available for an additional fee. Food from Taste Catering will be available throughout the Zoo for purchase. Tickets are non-refundable. Discounts cannot be combined. Animals will have access to heated habitats behind-the-scenes for this event, and will likely choose to be off habitat. Community Nights: Reid Park Zoo is proud to be partnering with the Humane Society of Southern Arizona, Community Food Bank of Southern Arizona, and Tucson A List for Community Nights during Zoo Lights presented by Tucson Electric Power. Receive $1 off admission for Zoo Lights from Dec. 7th – 19th when you bring in a toy, can of food or pet supplies. For a complete list of donation items accepted, click here. Encore Nights: Guests can enjoy the twinkling lights and animal displays during these extended nights of Zoo Lights presented by Tucson Electric Power from Wednesday, Dec. 26 until Sunday, Dec. 30 from 6:00 – 8:00pm. Since Santa will have to return to the North Pole, there will be no pictures with Santa during this time. Subscribe to the Reid Park Zoo newsletter and get zoo updates, animal news, special events and more.